Location: Hilarion Mine, Agios Konstantinos, Lavrion District, Attikí Prefecture, Greece. Scale: Picture size 1 mm. Comments: Clear, prismatic crystal of Searlesite. Location: Point of Rocks Mesa. Colfax County, New Mexico, USA. Scale: Not Given. Comments: Scanning Electron image of seidite-(Ce) with the axial components of a and c superimposed on crystal. Location: Yubileynaya pegmatite at Mount Karnasurt, Lovozero alkaline massif, Kola Peninsula, Russia. Scale: Image size 0.5 mm. Comments: BSE-SEM showing white lamellae are seifertite and the black lamellae consisting of dense SiO2 glass, probably formed by vetrification of another metastable post-stishovite silica plolymorph. Location: Shergotty meteorite. Scale: See Image. Comments: Black-green crystalline sekaninaite cleavage with dark purple colored fracture surface. Location: Rozna, Moravia, Jihomoravsky, Czech Republic. Scale: See Photo. Comments: Acicular crystals of native Selenium (up to 1 cm in length). Location: Ronneburg U deposit, Gera district, Thuringia, Germany. Scale: Specimen size 3 cm. Comments: Lead gray, prismatic seligmannite crystal with brassy yellow pyrite on white dolomite. Comments: Dark purplish blue crystal of selwynite. Location: A granite quarry near Wycheproof, NW Victoria, Australia.. Scale: Not Given. Comments: Tan crystals of semenovite to 1 mm across on matrix. Location: Ilimaussaq, Tasseq, Greenland. Scale: Picture size 1 cm. 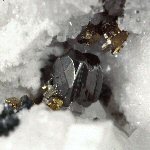 Comments: Crystal clusters of semseyite crystals to 1 cm on sphalerite. Location: Herja, Romania. Scale: Picture size 5 cm. Location: Herja mine, Maramures Rumania. Scale: 6.5 x 6 x 3.5 cm. Location: Dattas, near Diamantina, Minas Gerais, Brazil. Scale: See Photo. Comments: Black crystal of senaite. Location: Presidente Kibitschek, Minas Gerias, Brazil. Scale: Crystal size 2 mm.